Somehow finding themselves unable to sign a US distributor, Yota Devices plans to launch its dual-screen smartphone in the US via a crowd-funding platform, PhoneScoop reports. 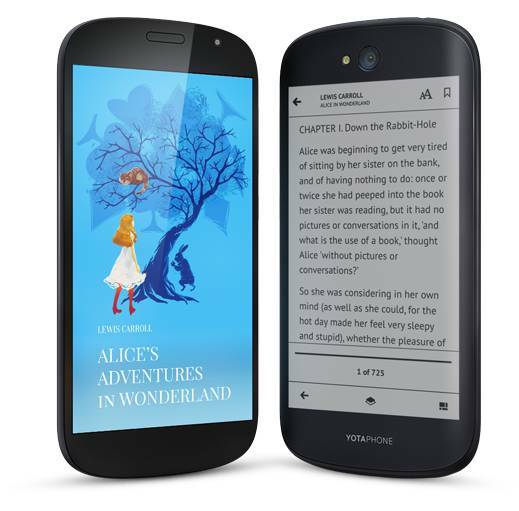 The YotaPhone 2 is a unique dual-screen Android smartphone which pairs a 5" OLED screen with a 4.7" E-ink screen. It runs Android on a Qualcomm Snapdragon 801 CPU, and can be had in Europe, Russia, and Asia for 700 euros. And when/if it is available in the US, it's expected to go up for pre-order for $600 - about $300 less than the current price on Amazon (from third-party sellers). That's a pretty high price tag for what would otherwise be a mid-level smartphone. The Yotaphone 2 runs Android 4.4 KitKat on a 2.2Ghz Snapdragon 801 CPU with 2GB RAM and 32GB internal storage. It also sports a pair of cameras (8MP w\flash, 2.1MP), a variety of sensors, Wifi, BT, and connectivity for ATT and T-Mobile. Just about the only noteworthy feature on the Yotaphone 2 are the screens. On the front you'll find a 5" AMOLED (screen resolution: 1920 x 1080), while on the back there is a 4.7" E-ink display (screen resolution: 960 x 540). Both screens have capacitive touchscreens, and both are protected by Corning Gorilla Glass. It's not a bad phone, but is it worth $600? Not to me, and something tells me that all the potential US distributors feel the same way. Best Buy isn't carrying the Yotaphone 2, nor is Amazon, Walmart, or AT&T. Instead the smartphone will show up on Indiegogo first. The lack of a US distributor makes me wonder whether the negotiators saw info not available to the public, sales data which left the negotiators underwhelmed. And that should concern you because the lack of local support adds risks. If a Yotaphone breaks you might have to ship it overseas to be repaired, which can be expensive.